Subrogation should be an expected part of the claims process when a hot water heater causes property or bodily damage. However, despite the widespread practice of subrogation in these instances, the data collection process has yet to be perfected. Knowing how hot water heaters fail and understanding some of the issues to look for are is a good start for expediting a subrogation investigation. Gas Leak – even a small gas leak in or near a water heater can become ignited from the water heater’s flame and create an explosion. Water Temperature – Water temperature should be between 120º-130º F. Water that is too hot can scald your tank and cause internal damage. Rust – Prolonged exposure to water can cause the tank to rust, especially if the internal anode rod has already deteriorated. One of the biggest challenges is expediting the claims process to ensure the insured receives timely compensation, but not missing any subrogation opportunities. It’s important for adjusters to know the right questions to ask and what to look for in water heater-related property losses. Find out if anyone had inspected or made adjustments to the water heater recently, such as routine maintenance or resolving a particular issue. If so, you need to speak with the technician to uncover additional details. Ask if they recall hearing any noises coming from the water heater, such as a popping sound. This could indicate the water was above the recommended temperature or that sediment had built up in the tank. Discover if they noticed a change in water color. Brownish-colored water could indicate the presence of rust, which might indicate corrosion in the tank. Ask how old the tank is. The life expectancy of an average water heater is roughly 8-12 years. If the water heater is younger than 8 years, it might be worth contacting the manufacturer to report the loss and see what’s covered by the warranty. Find out if there have been any repetitive problems that were resolved, such as water leaks. Have a professional inspect the T&P valve for damage or weakness. Look for sediment accumulation at the bottom of the tank or signs of rust inside the tank. Inspect the anode rod for signs of corrosion. It’s recommended that the anode rod be replaced every four to five years. 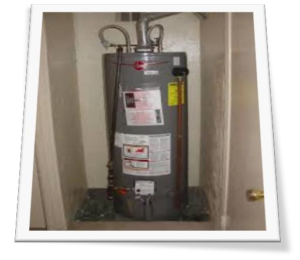 Finding the cause of the water heater malfunction is only part of the subrogation process. If you are able to narrow the possibilities, but are still unsure of the exact cause of the failure it may be time to engage an expert. Their report and findings will provide you the needed evidence to support the reason for failure, allow you to properly apply coverage and optimize your chance for recovery. National Forensic Consultants is a Global Leader in Multi-disciplinary forensic investigations. We have been providing expert investigations for the insurance, legal and risk management industries for over 20 years, including Cause & Origin, Product Failure Analysis, Fire and Explosion Investigations, Construction Defect investigations, Product Liability, Litigation Support Services and much more.